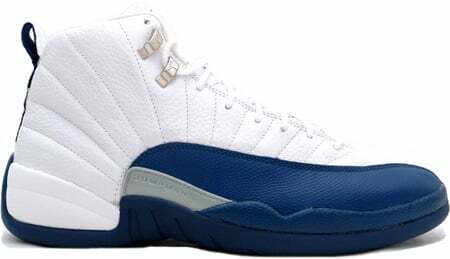 In 2003 and 2004, the Jordan Brand released a few Air Jordan XII (12) including a model nicknamed the “French Blue” Jordan Retro 12 (XII) for its color-way. This Air Jordan 12 (XII) Retro is composed of White, French Blue, Metallic Silver, and Varsity Red, this color-way is definitely a favorite among Air Jordan collector’s for its originality and appeal. It has been a few years since the Air Jordan 12 (XII) Retro French Blue was first released and this has caused a price raise despite its $135 retail price tag and January 10, 2004 release date.